It doesn’t take much to give me the vapours, but I guess that’s life in your forties. This week’s reason for coming over all peculiar is my latest Korean beauty buy – Rose scented hair serum by Mise En Scene. 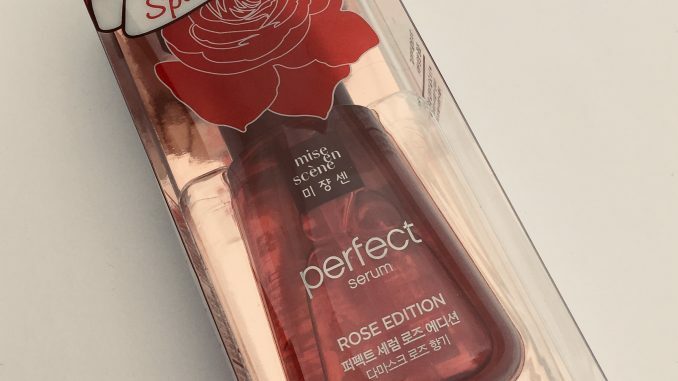 I first discovered Mise En Scene Perfect Serum back in 2014, when it turned up in a Memebox Korean beauty box. I’ve tried various hair serums since then, but this is the best one by far. It’s just so good at lightly smoothing out slightly frizzy hair. Korean beauty moves at a fast fashion kind of pace, with new products every season. So the fact that this product is still around tells you that it’s met the approval of a demanding audience. Mise En Scene Perfect Serum is primarily made of Argan oil. There’s also a mix of six other oils – camellia, olive, jojoba, coconut and apricot. And yet it doesn’t feel oily or greasy at all. If anything it feels quite plasticky. I’m guessing there’s a wallop of silicone/dimethicone in there. The ingredients are in Korean, hence the guess. The Mise En Scene brand is part of the wider Amore Pacific brand, a huge behemoth in Korean beauty. It’s sort of like L’Oreal, which is both a brand in itself and owns a bunch of other brands. Like any other serum, this is applied to towel-dried hair, mostly on the ends. If you have very dry or damaged hair, then this will leave it it soft and smooth without weighing it down. The rose fragrance is very light and subtle (not an assault on your nostrils with a rose bush). It lasts quite a long time so if you like to spend your evenings sniffing your own hair you’re in for a treat. It’s really fresh and delicious. 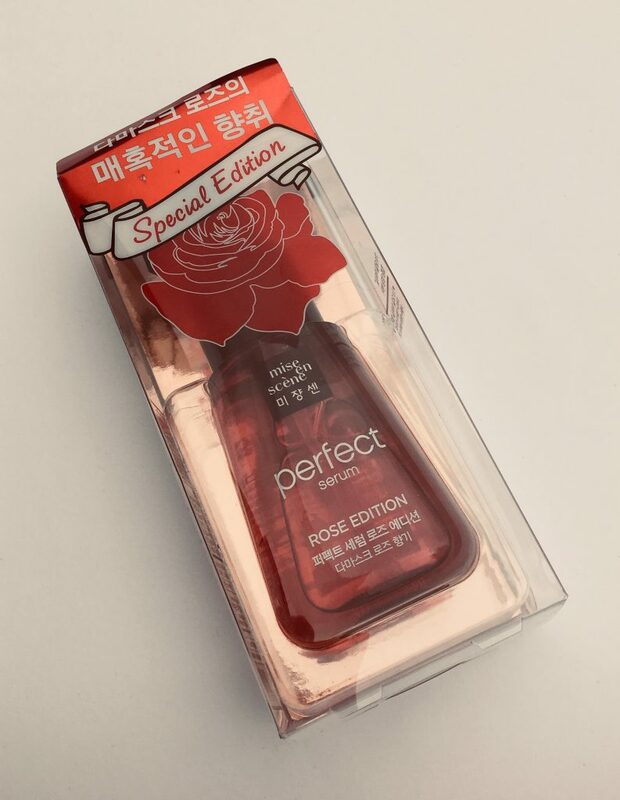 But if roses or hair sniffing aren’t your thing, then the original, unscented version of Mise En Scene Perfect Serum is still a great choice. If your hair is fried by colouring, heat treatment or just protesting at the general state of the world, this is what it needs, I promise. I bought this rose scented hair serum by Mise En Scene here on eBay for around £6 plus £3 postage. You can also find the original serum from various sellers on Amazon and many Korean beauty sites. Here it is at RoseRoseShop, a site I’ve used before and would recommend. I could only find the rose variety on eBay. It took around 10 days to arrive with me in the UK. PS If rose scents are your thing, check out this skincare and this lovely perfume.